We’re excited to announce our 50th year of manufacturing quality patio doors. With a long history and commitment to innovation, we’re proud to have reached this milestone. It all started in 1968 when aluminum patio doors were the popular material for home replacements. Milgard wanted to do more than just distribute someone else’s product, so, they conducted homeowner researching to determine what features would appeal to customers looking for patio doors. From there, we hired engineers who could develop quality, aluminum patio doors that we could manufacture ourselves. Fast-forward to today, fifty years later, where Milgard® is known as one of the largest and most trusted names for home windows and patio doors in the Western U.S. Our engineers continue to innovate creating industry-leading designs and technologies including finishes, glazing options and our award-winning SmartTouch® lock and handle. We now manufacture more patio doors than ever before and our product line has grown to include vinyl, wood and fiberglass in addition to the aluminum sliding doors we started with in the 60’s. 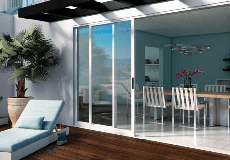 You can find patio doors for replacement projects or new home construction in both sliding and swinging door styles. Plus, our Moving Glass Wall Systems offer large glass panels that operate effortlessly to help you bring the outside in and truly enjoy your view. To celebrate our 50th Anniversary, we’re offering homeowners a $100 Amazon.com gift card with any Tuscany® Series, Montecito® Series or Aluminum Series sliding patio door or a $200 Amazon.com gift card for any Moving Glass Wall System purchased through February 28, 2018. Purchases must be made through participating Milgard Dealers.